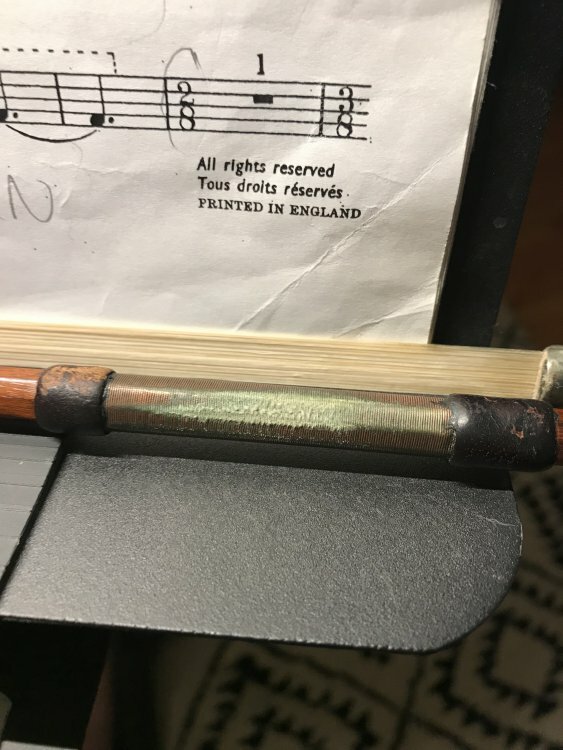 Pretty sure this is copper on my Grimm bow since the discoloration is greenish. How do I clean this until I get it to a luthier? This is not a copper wire wrapping. It is a tinsel wrap with silver (or nickel) plated copper winding on the thread. In some places the plating has worn off exposing the copper, and in other places the plating and copper are both worn off exposing the thread. This cannot be fixed by cleaning -- it can only be fixed by replacing it. If you attmept to clean it, it may fall apart, as in disintegrate. Try cleaning first with a fine copper brush. when that doesn't work or if it falls apart you can always replace it with nickel or silver wire. A cautionary tale. I have a bow that originally had a tinsel wrap that needed to be replaced. It was replaced with silver wire during a re-hair. The silver wire changed the balance for the worse, IMO. I had the bow re-wrapped in silk which restored the original balance. mistake. A wire brush would destroy even fresh tinsel. And as Jim said, if you replace it with wire, the weight and balance of the bow will be different. Might be better, might be worse, but it will be different. 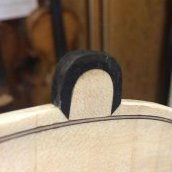 If you do have the winding replaced, have the bow weighed before doing anything so you know what its weight and balance are. That way the person who works on it will have a target. Also, if the weight and/or balance aren’t ideal, they can be adjusted. mistake. A wire brush would destroy even fresh tinsel﻿. And as Jim said, if you replace it with wire, the weight and balance of the bow will be different. Might be better, might be worse, but it will be different. I cleaned a nickel coated copper lapping once with metal polish (cheap bow), what remained was the clear copper wire, but it doesn't look that bad. It did not had the gunk as in the picture though. Thank you everyone! I ended up just going ahead and taking it to the shop and he’s going to redo it with silver lapping! Yes, that is fine with ni coated copper, but this is tinsel. Not metal, but silk. You can't really clean it. If it is the orig. tinsel, I'll sometimes cover it with a clear barrier, but it isn't really reparable. It is fine silk thread. Indeed, if you zoom the photo you can see the windings ..